Baby Bok Choy with Shrimp - Healthy and delicious baby bok choy stir fried with shrimp. 3 ingredients, so easy to make. Perfect for a wholesome meal. When it comes to Chinese vegetables, simple is best. There is really no need for a complicated recipe for vegetables. The key to success with Chinese greens is freshness—you want to just barely cook them, and with the most basic ingredients. That was exactly what I did with these baby bok choy. Some chopped garlic, some baby shrimp, and a pinch of salt are what you need to make this Baby Bok Choy with Shrimp. Humble in its presentation, this baby bok choy recipe pairs well with any Chinese dishes and it’s healthy and delicious! 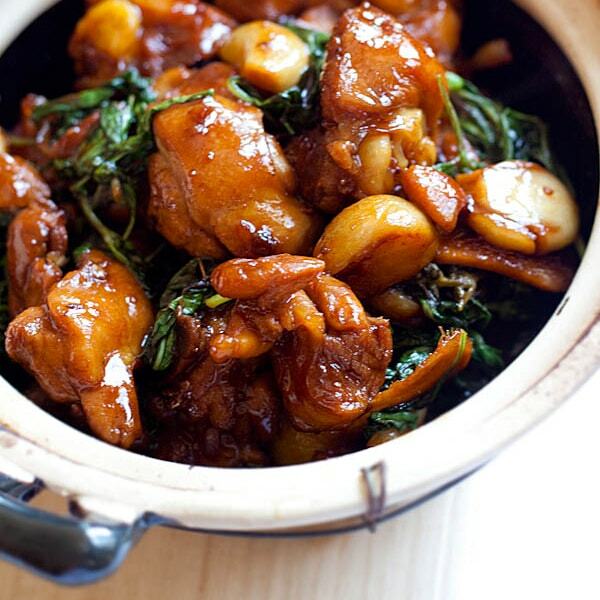 I hope you enjoy reading and learning about Chinese recipes on Rasa Malaysia. 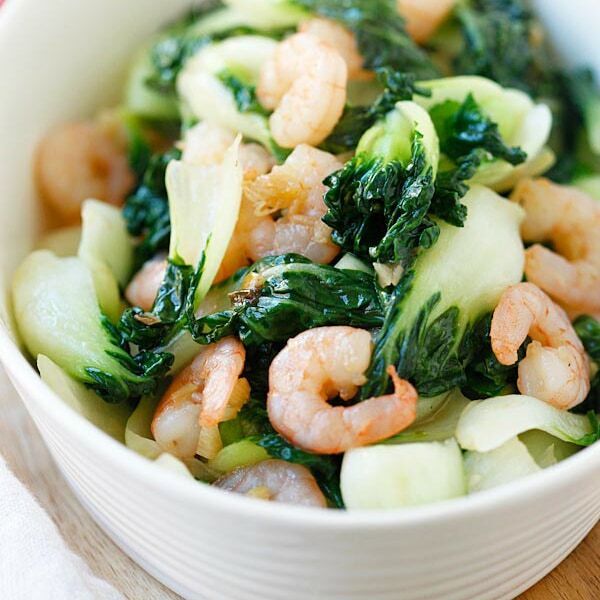 Baby Bok Choy with Shrimp – healthy and delicious baby bok choy stir fried with shrimp. 3 ingredients, so easy to make. Perfect for a wholesome meal. Heat up a wok with the cooking oil and saute the chopped garlic until light brown or aromatic. Add the baby shrimps and stir-fry until the shrimps are half-cooked. Add in a pinch of salt to the shrimp, and then follow by the baby bok choy. Quickly stir-fry the vegetables, dish out and serve hot. 1. Do not overcook your vegetables. They should retain the vitality and crunchiness. 2. Please check out my Chinese greens with oyster sauce recipe. yum yum…. see if i can persuade my wife to cook for me..
Sans shrimp, we like having this every now and then, esp. with fried food :) The greens can be a bit bitter for a sweet tooth like me, but bitterness has this “healthy” feeling, doesn’t it? I think bok choy mui is nicer than the regular bok choy. I like them. why didn i ever think of combining baby bok choy with garlic and shrimp? you are right. 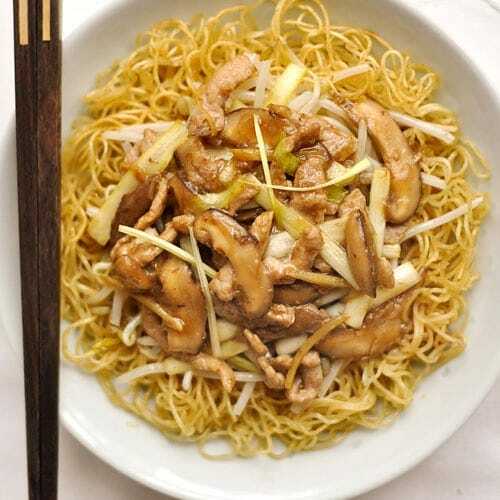 for chinese dishes, simplest is the best. This looks great. It’s very healthy, but looks filling too. I am glad you like the book! Can’t wait for you to share some of the recipes on your blog!! This dish is really simple and healthy I reckon. Sometimes, I just think that Chinese/Asian food is so quick and easy to prepare and that I am lucky to be able to enjoy it in minutes! Your whole Beijing Olympics series has been wonderful — great photos and recipes for some of the things we all learned to love at American Chinese restaurants. Well done, Bee! I like such simple dish too, delicious and yet healthy! I’m loving the Chinese food posts for the Olympics, and this one looks just fantastic. yes..i agree with you. Simple…for freshness….YAY! I like 菜苗 too – the color looks great too! Reminds me of the jadelite vegetable put to exhibit in NAtional Palace Museum in Taiwan. love baby bok choy…they are so tasty on their own…but putting shrimps into it is simply delish! that baby bok choy looks soooo good and cute! u r right simple is truly best. A wonderful combination! All three ingredients are delicious! Perfect! I donch eat this choi moi.. but love baby bok choi. Thanks for sharing. :) i always run outta idea what to cook. I am on a lookout for easy, healthy dishes to cook for myself, as part of my healthy eating plan. Wow, what a simple recipe yet packed with flavor. I have yet to try the baby Bok Choy. I am anxious to try this recipe. Thanks for sharing! I’ve tried today… n taste soooo nice. add a little bit of oyster sauce n lessen the salt… superb! Thank you for the perfect recipe for a beginner to Asian cooking! Love baby bok choi, picked some up at the local Asian market, and found this tasty treat. Very simple, quite yummy, and it gives me the satisfaction that I did this myself! ( I think that knowledge makes it taste even better.) Can’t wait to try another one of these recipes soon. Thanks again! I was searching for some recipes with Chinese Bok Choy so that I could adapt it to Indian Cooking. One thing I noticed everywhere was the use of garlic and the short cooking time. However, I made a Stir Fry (Thoran) and cooked the Bok Choy for around 10 minutes. I felt the stem tasted bitter when I cooked it for 2-3 minutes and so I stir fried it some more time until it was tender and then it tasted more like Cabbage. For Chinese, the vegetables need to be flashed cooked to remain crunchy and crisp in texture so they are not overcooked and completely soft and wilted. How many servings does this recipe contain? Loved this recipe. Love baby bok choy — so easy to prepare. I used medium size shrimp (21-25) because I already had them in my freezer — very juicy and tasty. And doubled the bok choy. I tossed with a splash of Kikkoman “Milder” low sodium soy sauce at the end for a flavorful touch. 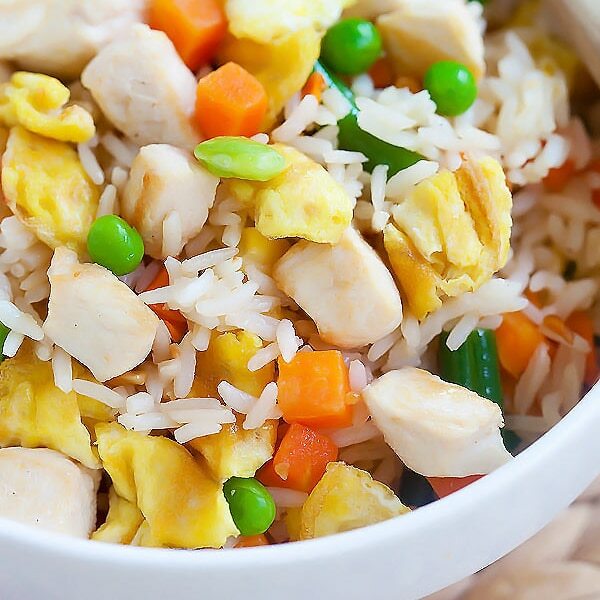 Wonderful over brown rice. Sounds yummy, thanks for trying my baby bok choy recipe.